Butcher Block Carts Are Versatile. They Enhance Productivity and Save You Time in the Kitchen. 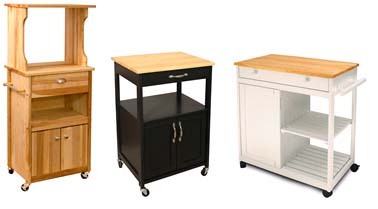 Not only do rolling carts add valuable counter-height work space to kitchens, they provide mobile storage space you can wheel to wherever it's needed. Load yours with fresh produce from the refrigerator that requires washing at the kitchen sink, for instance. Once done, you can move your cart out of the way to a quiet spot where you can use it as a prep or work station. Next roll your cart, loaded with prepared ingredients, right to your stove or oven, or to your main countertop for final mixing, blending or arranging for presentation. Use it to transport cooked dishes to the dinner table, or use yours as a serving cart wheeled around your kitchen, dining room or patio. There’s no limit to the versatility of kitchen carts. Boos & Co., located in Central Illinois, has been making blocks since 1887, first for blacksmiths who required strong, sturdy work surfaces for heavy pounding, and later for butchers who need a rock-solid surface on which to cut and chop. These beautiful wood tops vary in thickness and come in different grain styles. Edge-grain butcher blocks, as thin as 1.5 inches thick, feature long rails of wood that run parallel to one another. In blended-grain tops, the wood rails also run in parallel, but each stripe of the block is comprised of two or more pieces of wood. End-grain-style tops – some as thick as 7 inches - are quite different. They feature short rails of North American hardwood - either maple, cherry or walnut – that are stood on end and nested side by side in a grid design to form a beautiful checkerboard tableau. Since it’s the fibrous ends of sawn pieces of wood that comprise the block’s surface, they are better able to absorb sharp knife and hatchet blades. Some Boos carts are made entirely of wood – top, base and shelf. But for a more interesting look that melds the warmth and richness of wood with the clean look and practicality of stainless steel, consider a hybrid: a Boos cart with a hardwood butcher block top afixed to a stainless steel base. You’ll love the beauty and convenience of a chopping block top. You can choose shelves made of either flat, perforated or tubular stainless steel. The latter is perfect for storing wine bottles. Plus, gorgeous butcher block is a classy surface on which to serve wine. Catskill Craftsmen, located in New York’s Catskill Mountains, specializes in locally-harvested yellow birch wood. 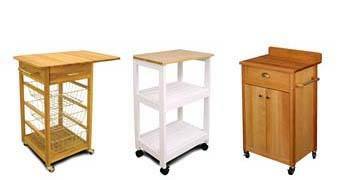 They make a wide range of rolling islands, work centers, storage and prep carts and small utility and microwave carts. If you’re tight on counter space, consider moving your countertop microwave to a cart. Microwave carts are not only versatile, they're compact enough to be tucked under a counter, in an out-of-the-way corner or in a utility room or closet. The professional-chef duo of Chris and Chris has designed the gourmet’s delight. A hole ("pig snout") cut in the butcher block top of a Chris and Chris compact prep cart serves a double purpose. The chef can slide into the hole and a steel catch pan below the cuts of meat or veggies he or she wishes to retain; or he/she can replace the pan with a trash ring that holds a waste bag and easily dispose of scraps and unusable trimmings.